Rivendell Great Hall is an historic building in the Thomas Walker Estate of Concord West Hospital in Sydney NSW. 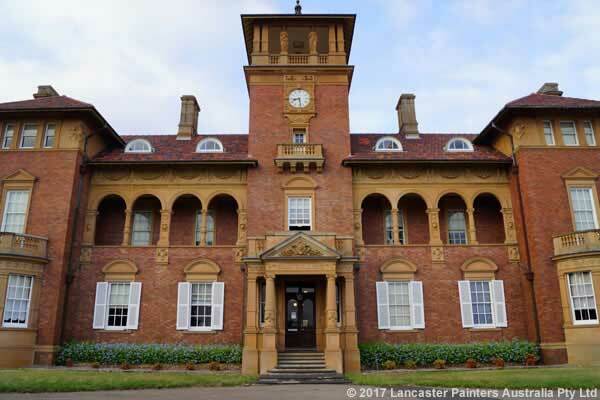 In January 2017, Sydney Local Health District hired Gary Lancaster to perform sensitive and accurate heritage conservation, reconstruction, artistic and beautification work as per the Burra Charter. The hall had not been painted or decorated in the last 100 years and was in desperate need of repair and repaint. It involved the repaint and decorative finish work of the walls, woodwork and the ceiling of the main hall, the stage and ceiling. Gary carried out moisture testing and lead testing prior to commencement of work. He implemented procedures for safe lead containment and removal of all rubbish created by the works. Gary supplied lead safety gear and covered the areas and items including light fittings using plastic and drop sheets. He erected warning signs and wet paint signs. Safe work methods and environmental sustainability practices were used throughout the job from start to finish. Next, Gary took paint scrapings and had them analysed in order to match the existing colour scheme. He supplied premium quality paint and materials for the work including artists paints and 22.5 karat gold leaf. Extensive preparation work included sensitive cleaning, filling and rubbing down and scraping down of surfaces. All the timber work was sanded down. Gary cleaned the interior of the stained glass windows and replaced the deteriorated putty. He also restored the broken decorative plaster items and features back to their former glory, replicating the original designs. Motifs and decorative items were sensitively cleaned with due care. Decorative finish work included antiquing of the flutes and bases of the columns and re-frosting of sash windows. Gary delicately applied 22.5 karat gold leaf to the gold leaf sign writing and pin-striping on the walls, and also to the small motifs with the insignia. After cleaning the motifs and designs, he artistically restored them using quality artists paints. And finally, Gary spray painted the three metal light fittings in the centre of the main auditorium ceiling. At the age of 18, in 1822, Thomas Walker arrived Sydney from Leith, Scotland to work for his uncle in the merchant company, Jones and Walker. On the retirement of the senior partners, the business was transferred to Thomas and his cousin. However, Thomas’ keen business sense, ambition and prosperity for hard work enabled him to expand his commercial interests, which included large pastoral leases. He purchased 12,700 acres (5,140 ha) of prime land around Port Phillip, Melbourne, in 1837 for less than ₤16,000. Within a few years, the land’s value increased to half a million pounds, coinciding with the rapid growth of the settlement. In 1843, Walker was elected as a representative for Port Phillip in the Legislative Council; one of his objectives was to support the movement for independence for Port Phillip from New South Wales. However, within 2 years he had to resign from politics to concentrate on his business interests. Walker became a Director of the Bank of New South Wales in 1859. He was on the committee which drafted a new deed of settlement to enable the bank to greatly expand its operations. From 1869 to 1886, Walker was promoted to President of the bank. In this period, the bank became the largest in the country and comparable to the large monetary institutions of Europe and America. It was not until 1860 that Walker married. His first wife, Jane Steel Hart, was 30 years his junior. She died in 1870, leaving one child Eadith, then aged 9. Just prior to her death “Yallara” House (now the Dame Eadith Walker Convalescent Hospital, which is located on the point to the east) was built as a family residence. Thomas Walker died in 1886. During his life, he donated large amounts of money to charitable and educational institutions, and often directly to needy individuals. He adopted John Wesley’s saying “Make all you can, save all you can, give all you can”, as a personal philosophy. Thomas Walker had a request codicilled in his will for ₤100,000 pounds, to be allocated for the foundation of a Convalescent Hospital on 32 acres (13 ha) at Rocky Point – west of his Yaralla estate. Following Walker’s death in 1886, his daughter Edith, and the trustees of the will began organising the establishment of the Thomas Walker Convalescent Hospital. The commissioned architects were Sulman and Power, while the contracted builder was Alexander Allen. John (later Sir John) Sulman has become recognised as one of the foremost 19th century architects working in Australia. Building commenced in 1891 and in 1893 the hospital was opened at a final cost of ₤150,00. Much of the difference from the amount received from Thomas Walker’s will was met by Eadith and her foster sister, Mrs J Sulman. The main hospital complex, was designed in the Federation style based on a pavilion format. Each pavilion or wing was planned to retain its functional integrity with the central block that was used for administration. There are 2 Italian Renaissance-style inner courtyards with fountains. The 2-storied central block includes an intricately detailed 3-storied tower over the main entrance with its roof supported by caryatids. Behind a magnificent vestibule there is an entertainment hall for 300 people. This hall contains 7 stained glass windows, including the Raphaelite depictions of Temperance, Justice, Prudence, Hope, Faith and Charity. Above the stage is the motto “Per Varius Casus”, and circling the hall at ceiling height in gold leaf is the legend “This Hospital For Convalescents Was Founded By The Late Thomas Walker Of Yaralla In The Hope That Many Sufferers Would Be Restored To Health Within It”. Craftsmanship of the sandstone exterior and internal wood panelling is attributed to artisans brought from England and Italy. Within the hospital grounds there are extensive gardens and subsidiary buildings, including stables, a gatehouse, the Joanna Walker Memorial Convalescent Children’s Cottage Hospital (named after Thomas’ sister who came to Australia to care for Eadith after the death of Eadith’s mother) and a water gate. The style of these buildings is compatible with that of the main complex. In its entirety, the estate produces a formal yet unique landscape, which is an important visual asset for the Parramatta River foreshore. After opening, over 70,000 patients convalesced at the hospital, including servicemen from the 1914-1918 and 1934-1945 World Wars. In 1977, Rivendell Adolescent Unit, led by its founding director, Professor Marie Bashir (later Governor of New South Wales), moved from its original setting at Broughton Hall to its present location at the Thomas Walker Hospital. Each year more than 500 children and their families benefit from treatment at Rivendell. The unit is also a centre for training of professionals in this discipline and is a teaching unit of the University of Sydney. Subsequent Directors of The Rivendell Adolescent Unit have been Professor Joe Rey (1988-2000), Associate Professor Garry Walter (2000-2005) and Professor Philip Hazell (2006-). Over a number of years, Rivendell’s buildings and grounds have been used in several movies and television shows. These include “Flirting” with Nicole Kidman and Noah Taylor, “Bangkok Hilton” with Nicole Kidman, “The Man Who sued God” with Billy Connelly, Judy Davis and Colin Friels and “Superman Returns” with Kevin Spacey and Brandon Routh. In the 1990s, Rivendell was even enveloped in a “coat of snow” for a small outdoor scene in the movie, “Lorenzo’s Oil”. This section is currently under construction. It will be finished shortly. Thank you for your patience.